Now I don't know if you've noticed, but I've been to a fair few theme parks in my time. I've basically been visiting parks my whole life, so there are certain parks that I don't have that great a recollection of visiting for the first time (or any in fact for certain parks!) And then there are parks where, despite having a good time, I didn't get off on the best foot with. I've always wished for the chance to visit those park again for the first time, whether to finally get to experience what that first 'wow' moment would be like or to eradicate a bad first experience. Here we go! I honestly have no idea for certain of the first time I visited the Towers, but I would hazard a guess at some time towards the end of 1994, because Nemesis definitely existed (I remember standing with my pregnant mum waiting for my dad to finish riding as she couldn't go on herself). I have some very vague memories from this first trip - mostly of that moment standing in Forbidden Valley and staring at the awesomeness that is Nemesis and also riding Beastie and pretty much shitting my pants. Towers in the nineties just sounds like the most magical, wonderful place. I would love the chance to re-experience what it was like to walk through those gates, especially in the year when something as game-changing as Nemesis was brand new. Obviously I'll still brag and say look at me, I visited Alton the year Nemesis opened, but I'd be lying if I said I remember even a shred of understanding the relevance of that. To relive that experience would be amazing. Ah, my beloved Phantasialand. 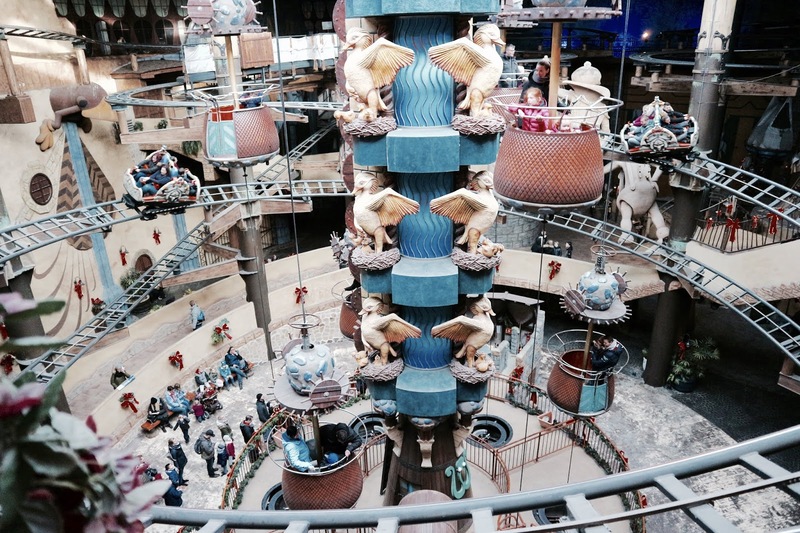 Look, I won't say I didn't love my first time at Phantasialand, because I definitely did, but you need to understand a few things. Firstly, I had cred anxiety. On my first visit in 2011 there were only four coasters to nab. Chiapas didn't exist. Maus au Chocolate didn't exist. But nevertheless, the cred anxiety persisted and I couldn't settle down and enjoy my day until the list had been smashed. Secondly, we didn't arrive until around 11.30AM. If the cred anxiety was bad already, that just made it ten times worse. Then on TOP of that - the place was absolutely bloody rammed. Urgh, even remembering it now sends a shiver down my spine. So yes, it was fab, we got all the creds and then some, but it was honestly one of the most stressful theme park visits of my life. It was a park I'd wanted to visit forever and I was so determined to have a good time that I ruined it for myself. I'd love to get the chance to do it over, spend a couple of days and just chill out and soak it all in. Another subtle brag, first time I visited Magic Kingdom I was a tiny three year old nineties baby, and whilst we do have some old family footage of this first visit, I don't have any memories of walking through those gates for the first time, seeing the castle slowly get bigger and bigger, soaking in the magic. I'm always so jealous of Conor when he recounts the first time I took him to Disney - he remembers it all so clearly and that moment was so special to him. For me, I grew up visiting the Orlando and Paris parks. That sounds really spoilt of me and I understand if you think that, but I definitely would trade it for the chance to be a Disney virgin again and to truly soak in the moment of being in a Disney park for the very first time. Oh god, this day was an absolute disaster haha. Essentially, the day before we were due to visit NSL, the news was reporting that a typhoon was on its way. Being British and used to a bit of rain, we kind of ignored it and didn't take it half as seriously as we should have and decided to go anyway. Bad. Idea. I will never forget pulling into the car park and barely being able to see through the sheets of rain. There was a tiny glimmer of hope - Steel Dragon was operating! We wandered in and exchanged some broken English/Japanese conversation and realised from the map showing little umbrella symbols next to certain rides. Maybe it wouldn't be so bad after all? Well actually no, the symbol meant operational during rain and was only next to around 3 rides, so we were fucked. We got about three creds and spent most of the day sat in a cafe lol. We went back to the park at the end of the trip but the initial excitement was gone and because we only had a few hours in the park we didn't really have time to enjoy it. Lame. What parks would you revisit for the very first time if you had the chance?